How much of a psycho are you? A few tests, as I know that there are a few people who ask the question, am I the sociopath? After being with a sociopath, they can make you react so badly you question yourself. So, I found these tests. For anyone who wants to try them out. You are warm and empathic with a heightened awareness of social responsibility and a strong sense of conscience. You like to carefully weigh up the pros and cons of a situation before you act and are generally averse to taking risks. You are very much a ‘people person’ and dislike conflict. ‘Do unto others…’ are your watchwords. But, although you avoid hurting others, those residing at the higher end of the psychopathic spectrum might not be as considerate, so stay vigilant to avoid being hurt unnecessarily. Your score from primary psychopathy has been calculated as 1.2. Primary psychopathy is the affective aspects of psychopathy; a lack of empathy for other people and tolerance for antisocial orientations. Your score from secondary psychopathy has been calculated as 1.5. Secondary psychopathy is the antisocial aspects of psychopathy; rule breaking and a lack of effort towards socially rewarded behavior. I have no idea if that is good or bad, or in the normal range. Does anyone else want to do these tests ? I want to know if I scored high… I have written about this for a year now, and often wonder, how do I understand it so well? 1.4 primary sociopathy 2.2 secondary whoa.. im a risk taker but never at others expense. . I think that is what secondary is. Its not high 2.2 I don’t think. Primary is hurting others. Secondary is bending the rules etc (am surprised I didn’t get higher on secondary). 18% on the first test. I took the 2nd test and see your scores were quite low, they could have explained the results a bit better, but you are pretty much the opposite of sociopath according to these tests. The graph shows a lot of scores all over the place with the highest concentration being in the mid-range of these scores. I wonder if a lot of targets of sociopaths score very low on these tests? Does a sociopath recognize this in a person and exploit that to their advantage? Just a guess? Walking on ceiling = walking on water? Either way it’s weird? Makes me think of that creepy movie “Drop Dead Fred”, the imaginary friend in the box. Yeah, I did wonder about that question about walking on the ceiling. How bizarre? Well I got 9% – and I thought I was a little more badass than that. Hey Darling, I also scored 9%..
Dear Positiva – I just took the quizzes and got 27% also! I thought maybe it was rigged and tried to take it imagining what my ex might say if he was able to be honest – and it came out to 87%…ha. I got 1.1 for the primary and 1.4 for secondary in the other quiz. I must try answering for the Soc, sounds interesting! I tried Hares psyco test a while ago. I scored somewhere between 1-2 which is very low. Sorry for being incognito – there is no need for my ex. to see me around pages like this, he is giving me enough trouble as it is. Your welcome lulu, they do make you think!! !… I was thinking well, maybe I am, I understand it so well. Why do I understand it so well, perhaps this is me. I read those questions, and thought – no… that’s not me. I might be a bit naughty sometimes and bend the rules, but I wouldn’t ever want to use anyone else for my own gain. Ugh Oh, I was 24% on the 1rst and my Levenson Self-report was 1.3 & 2.8%, respectively. I see how I rate near the majority on the color scale, but seems I am “on the lower fringes”. Look, I know I have some issues; not relating to people, being felt like I am on outsider, suspicious of other people until I get to know them, feeling like I am the “class clown” in work situations, getting into heated exchanges throughout my working years, etc. I have been known to “open mouth- insert foot” more than I care to remember. I am good at making up, though, and always trying to mend fences. So I have talent there. What can I say at the most sensitive moment to REALLY hurt you? I spit out my coffee when on one of the test it said ‘do you like to imagine your partner that caused you pain be in equal or worse state’, or something like that, and I think, “oh hell yeah”. But isn’t that sick, too? I think I put neutral because even I recognise how sick it is to want that. I always refer back to a quote I heard awhile back that says, all humans, being in this bizarre state of consciousness that we endure, are only a neuron away from going batsh!t crazy! How I feel much in life- and look at the news, the streets, the whole bloody world- it’s amazing anything really endures here! 30% on the first test, 1.5 primary and 1.8 secondary, what I found interesting, is what I would of put down as my answer prior to NS and how I feel today. Rather sad. Who hoo! 15% yeah me! I guess all the youre crazy or bipolar comments are more of his lies and problem not mine. It’s a cute short quiz to get the “gist” of what makes a person more or less sociopathic. As we know, real diagnosis is much more involved and complex so that it is less obvious how you should be responding. A real sociopath would find it easy to lie on this quiz to get a more human score. Even at McDonald’s they had my daughter take a 100 question personality test during her interview, it took forever! Her manager told her months later that it was basically to see if she’s a sociopath or not…I can’t imagine what Dr Hare would think of that! This is good. I understand quite a lot about trolls, years ago, I ran an MSN news forum, and we had a lot of trolls on our site (it was around the time of Sept 11th). I don’t think these people were trolls though, I think that they were putting their view out there, in that they disagreed with my post. Trolls are there deliberately to cause trouble, and can write the most shocking things. I didn’t see that with the comments – I thought they were genuine thoughts by socio’s who were aggrieved. I know it was the one post that the socio in my life objected to the most also. As he said it wasn’t true. This is why I raised it. I have a few trolls on my site. Obvious socs, yet good for controversy and ratings! I leave their posts for that reason but try not to pay any mind to them. The world looks so different now that my eyes have been opened. The narcissist who opened my eyes with his “by the book” behavior actually started out as a blog troll, but having been somebody I knew from my past I thought he was safe despite his weird comments. I guess I can actually say, I’m grateful for the trolls! I agree, we don’t seem to get many here. But I think that is because if it is a direct personal attack the comment doesn’t get through. I don’t care if socio’s post here. As long as they don’t attack anyone else. Has your website changed radically? I am sure it wasn’t like that before? My website began as a place to vent about an on-again/off-again affair with a man whom I would later find out to be a sociopath. I was going crazy again over being discarded and replaced with his newest source of supply. I thought I was in love and couldn’t understand why he would just walk away. So I posted all the gritty details. I had also started a path of self discovery and began working with a spiritual healer. So, I started about other bad things, to get it out. The more I wrote, the better I felt and the deeper my stories became…..eventually I started digging deeper into my past. I stayed writing about my childhood. I did it all with a different perspective though. It was like I was channeling the soc/narcs point of view. I think that’s what finally brought the one who opened my eyes to me. I find that a lot of my fan base are soc/narcs. My character in a lot of ways acts like she has no emotion and enjoys hurting others. It makes sense to me but I’m not sure if it does to you! I’ve changed dramatically since I’ve started writing and so had my blog. It’s like I opened up and let down the walls and started feeling again. Once that happened I was just overwhelmed with emotion. I’ve been far too empathetic and depressed this last year but FINALLY I’m starting to find a happy balance. There’s just so much to figure out once you start to see. The whole world is different. I’m grateful I was able to find your blog, and many others that have helped me through this journey. Yours was the first! You’re blog was the one that put the pieces together! I think we underestimate the power of our writing and the impact it REALLY has on the world! I get the worst types on my blog. Daily search terms of molestation (and worse) land puerile onto my blog (I don’t cover those types of stories at all). Yet, every so often I get a young reader thankful for finding one of my stories and asking for help via emotional support and advice. This day in age, to be able to reach people all over the world is just astounding. It makes me realize how small the planet really is! Sorry! Didn’t mean to go off on a tangent! But yes! My site is ever evolving! When I was a child, I remember crawling around the house backwards, looking through my legs at the ceiling, pretending I was walking on it. It was freeing and just my imagination. I would later dream of being able to fly to the ceiling. In these scenarios, I was usually escaping someone. I took it a step further. I took the test for myself and scored 15%. “You are warm and empathetic with a heightened awareness of social responsibility and a strong sense of conscience. You like to carefully weigh up the pros and cons of a situation before you act and are generally averse to taking risks. You are very much a ‘people person’ and dislike conflict. ‘Do unto others…’ are your watchwords. But, although you avoid hurting others, those residing at the higher end of the psychopathic spectrum might not be as considerate, so stay vigilant to avoid being hurt unnecessarily. My friends, especially the ones who have known me pre- and post-SP, tell me I am too nice and because of that, I have been told that from now on I must present any potential suitors to the “approval committee” before I am allowed to date again!! LOL Of course, this was all in fun – but since I already decided I am an a$$hole magnet, I may take them up on it IF I ever decide to date again! I then went back and along with my sister, we took it answering the questions as we perceived my ex-SP would. Mr. Happy scored a whopping 88% and on several questions we scored him lower than we thought he might score himself. Really telling when you compare the two scores. It’s interesting to see the scores… Did you score your SP?? It was amazing to even estimate how he would have answered and then see the results. Talk about validation!! LOL. My Spath scored 100% so, validation definitely. I remember once when one of my children’s little guinea pigs was ill & he said ‘just neck it!’, I was horrified & took it to the vet so, I had no trouble answering that question for him! He also gave me lots of other answers over our time so, i pretty much believe that the 100% is accurate. 1.4 Primary: Primary psychopathy is the affective aspects of psychopathy; a lack of empathy for other people and tolerance for antisocial orientations. 1.7 Secondary: Secondary psychopathy is the antisocial aspects of psychopathy; rule breaking and a lack of effort towards socially rewarded behavior. Weird.. 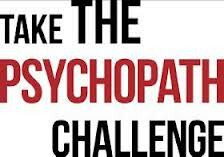 I thought, I like conflicts, though only as an observer..
You have completed the Levenson Self-Report Psychopathy Scale. Your score from primary psychopathy has been calculated as 4.8. Primary psychopathy is the affective aspects of psychopathy; a lack of empathy for other people and tolerance for antisocial orientations. Your score from secondary psychopathy has been calculated as 4.4. Secondary psychopathy is the antisocial aspects of psychopathy; rule breaking and a lack of effort towards socially rewarded behavior. So according to these two tests…TOTAL PSYCHOPATH. I am not going to agree or disagree…I am not a monster and my life goals/ambition are not to cause chaos and havoc in the lives of other people. I am married…two kids…excellent career. I’m even looking into being a Girl Scout leader/mom.